We had a little mishap with our old domain and have changed our domain to http://www.masteringtheknitspodcast.com! Please update your bookmarks and thank you for the support. This week’s segments include In our Hands, Masterpieces, Spread the Love, Simply Selfie, Raise your hand, and Comfort Zone. Alicia has only been actively knitting on her Harvest Cardigan by Tin Can Knits with Cascade 220 Superwash Quatro in Fiji colorway. Alicia shares that she got the yarn for a great price at http://littleknits.com/. Natalie is knitting on Crackerjack by Stacey Simpson Duke using Knitpicks Swish DK in White, Honey, Dusk, Twilight. She is continuing to work on Uncle's Christmas Stocking by Dorene Delaney Giordano using Knitpicks Wool of the Andes Sport in white and Amethyst Heather although she has been struggling with the needles she’s using. Natalie mentions buying tickets from Stash - a place for yarn for the Tampa Bay Rays Stitch n Pitch which is on July 26th. You can pick up tickets from the link or at the shop. Natalie has also been knitting on her One More Row socks using Lollipop Yarn Tradition in the We need a Little Christmas colorway. We mention #christmasinjuly KAL with Mary Heather from Ravelry.com and RainyDayGoods.com. Lastly, Natalie cast on a Luuk by Annis Jones using some leftover Knit Witch Celestial in the Sagitarius colorway. She talked about how she used the cast on number from the Swirl Hat by Mandie Harrington. Alicia talks about some lovely stash she acquired from Knitpicks.com and discusses her favorite designer Ysolda Teague’s new design Ishnana. Alicia hasn’t finished anything although she has been doing a lot of monogamous knitting on her Harvest. Natalie has finished three more blanket squares for her eldest Barn Raising Quilt by Shelley Mackie & Larissa Brown using leftovers and some Shelby B's Designs 100% Superwash Merino in the sirius colorway #againstthegrain. She also finished a baby Luuk by Annis Jones using some leftover Knit Witch Celestial in the Sagitarius colorway. She took the cast on counts from the Swirl Hat by Mandie Harrington Natalie cast on and finished a Sockhead Hat by Kelly McClure using Patons Kroy Sock in the Rusty Stripes colorway. Winner is: Ann Templeton @annfran25 on twitter. Our next giveaway is going to be from Bohemia Fibers! 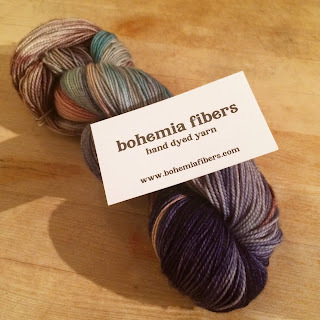 Amy, the dyer behind Bohemia Fibers, is a lady with a love of color and a knack for it. Bohemia Fibers specialize in custom colors and inspirational photo replication. They use only professional dyes for their yarns and fiber. They do yarns based on pictures from popular tv series and movies. I have has purchased several True Blood and walking Dead inspired colorways. Amy has graciously sent a skein for Natalie to knit up and review as well as a skein in the same color for us to give away! Thank you Amy!! To enter this episode’s giveaway, we ask that you visit Bohemiafibers.com and pick one of their many colorways that inspires you and share your favorite with us in a comment on the shownotes page. There will also be several other ways to enter this giveaway! Check out www.masteringtheknitspodcast.com to see all the ways you can win. Alicia and Natalie got to spend some in person time together up in Ohio. Natalie loved spending time in Alicia’s backyard and was very inspired by Alicia’s home. Alicia had a busy 4th of july with lots of festivities. She also discusses her basement, weddings coming soon, and her and her husband’s 1st wedding anniversary! Natalie talks about their road trip up north to visit family and Lisha and getting to meet the new twin nephews. Ohio summer lies...thankfully Natalie brought her girl’s Wonderful Wallaby sweaters. While in Ohio, they did lots of things which included visit the lake and also getting to finally visit Homer Laughlin China Co.
We ask if you can have any profession in the fiber industry, what would be your dream job? Natalie talks about the Woolful podcast, which is currently her favorite, and discusses the idea of becoming an owner of a sheep/alpaca farm or owning a fiber mill. Alicia wants to be a yarn smoosher. Natalie mentions Clara Parkes. Alicia would like to dive into knitwear design world and learn more through the Master Knitter Program. What would you like to do? Alicia says her happy place is good mail and mentions Birchbox. Natalie’s happy place is turning her house into a home. Thank you for joining us for episode 16 of Mastering the Knits. You can find shownotes at www.masteringtheknitspodcast.com or on our ravelry group Mastering the Knits Podcast. You can email us at masteringtheknits@gmail.com. Follow us on Twitter @MtKnitsPodcast. Alicia is knottyknitter17 on Ravelry, Twitter, Instagram. Natalie can be found on twitter, Instagram, and ravelry as barknknit. I love her outbreak color in the repeatable section. A good one!! Thank you for entering! beautiful yarn! I love the muted colors of Boxcar Bandits in the repeatable color way. That's a great choice! Thank you for entering! Absolutely gorgeous yarn. The Dill Pickle yarn caught my eye right away. Great podcast! Thank you for entering!! Glad you enjoy the podcast! I really love the White Rabbit colorway.